After eating a large meal last night, I noticed that my tummy had significantly enlarged. After that, I started wondering if eating too much could cause a stomach to explode. Could this actually happen? Are you able to explode your stomach by eating too much? Can it pop or break? I assume your body would just regurgitate the extra food. What if you held in the regurgitation? Then would you explode? The stomach accomplishes much of its function by mechanically breaking down the swallowed food particles and mixing them with acid and enzymes into a sort of slurry. To do this, there are three major layers of muscle surround the stomach - from the outside, the longitudinal layer, the circular layer, and the oblique layer. 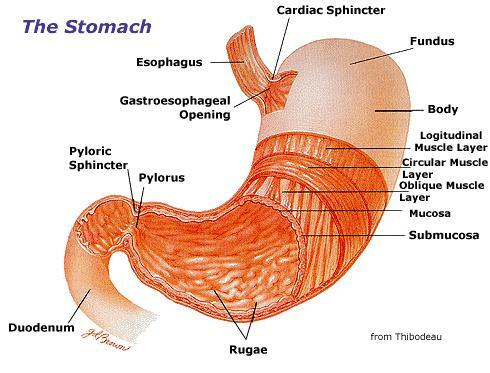 The stomach also has two holes in it - the gastroesophageal opening, coming from the esophagus with the swallowed food/saliva mix, and the pylorus, where the food/acid/enzyme slurry exits into the duodenum, which is the beginning of the small intestine. Due to the three layers of (rather strong) muscle, the stomach doesn't have a lot of expansion capability once it is filled completely to capacity. Fortunately, this almost never occurs (despite how we may feel after a large meal) because material is always leaving the stomach on its way to enzymatic digestion in the intestines. Additionally, once the stomach is filled to a certain extent, hormones such as leptin are secreted that give you the feeling of being sated, or full, triggering the brain to make you stop eating. Of course, as we can see with the current epidemic of obesity around the world, the stomach can change its size over time. However, this is a rather slow process (weeks to months to years) of adapting to continuously consuming large meals. But what would happen if you completely ignored these internal warnings, or were being force-fed, or whatever? Instead of rupturing (the biological equivalent of "exploding"), food would most likely be expelled either into the small intestine or back into the esophagus and back up the way it came down, i.e. causing vomiting. For this answer to be complete, however, I should point out that stomach or gastric rupture is technically possible, although it is an extremely rare occurrence. Cases have been described in the literature (1, 2, 3, etc. ), but they are rarely correlated with overeating or eating disorders like bulemia. In cases that are, other pre-existing conditions such as gastric ulcer have been found on autopsy that likely weakened the stomach wall in the first place. The bottom line - if you're an otherwise healthy person, a single instance of massive binge eating is very unlikely to end in stomach rupture, as vomiting will most likely begin well before you are in significant physical danger. Digestion is the process of changing food into a form that the body can absorb and use as energy or as the raw materials to repair and build new tissue. Digesting food is a two-part process that’s half mechanical, half chemical. Mechanical digestion begins in your mouth as your teeth tear and grind food into small bits and pieces you can swallow without choking. The muscular walls of your esophagus, stomach, and intestines continue mechanical digestion, pushing the food along, churning and breaking it into smaller particles. Chemical digestion occurs at every point in the digestive system, beginning when you see or smell food. These sensory events set off nerve impulses from your eyes and nose that trigger the release of enzymes and other substances that will eventually break down food to release the nutrients inside. The body then burns these nutrients for energy or uses them to build new tissues and body parts. ALSO HERE ARE THE COORDINATES OF YOUR "TUMMY": Your stomach, a wide, pouchy part of the digestive tube, is located on the left side of your body above your waist and behind your ribs. Like the walls of your esophagus, the walls of your stomach are strong and muscular. They contract with enough force to break food into ever smaller pieces as glands in the stomach walls release stomach juices — a highly technical term for a highly acidic blend of enzymes, hydrochloric acid (HCl), and mucus. The stomach juices begin the digestion of proteins and fats into their respective bodily building blocks — amino acids and fatty acids.Churned by the stomach walls and degraded by the stomach juices, what started as food — apples, pears, potato chips, steak, cake, you name it — is now a thick, soupy mass called chyme (from chymos, the Greek word for juice). The stomach’s wavelike contractions push this messy but still intact substance along to the small intestine where your body begins to pull out the nutrients it needs. Moreover you should consider that the stomach is made from muscles; that makes it strong and immune to HCL. So, if even a very strong acid like HCL can do any damage to the stomach, will a very big meal make it to explode? Simply it will force yourself to vomit just because the very big ammounts of food can't be digested. Not the answer you're looking for? Browse other questions tagged human-physiology digestion stomach or ask your own question. Can you build muscles from watching point of view videos of people weightlifting? Why does rapid decompression make you lose useful conciousness so fast? How can diving with 100% oxygen not destroy your lungs?